As sisters they share an everlasting bond; As queens they can break each other's hearts. When Katherine of Aragon is brought to the Tudor court as a young bride, the oldest princess, Margaret, takes her measure. With one look, each knows the other for a rival, an ally, a pawn, destined - with Margaret's younger sister Mary - to a sisterhood unique in all the world. The three sisters will become the queens of England, Scotland, and France. ©2016 Philippa Gregory (P)2016 Simon & Schuster, Inc.
although I preferred other stories by Gregory and this was a bit long, it's still an interesting and fascinating story worth telling. This was fantastic. Loved it tremendously. Bianca Amento is a magically talented narrator. Not only did she do a spectacular job in the uniqueness of the wide variety of accents for each person, but she was also able to keep track of them and seamlessly swich from one character to another. Probably the single most talented narrator I've heard to date. The title, however, is a bit misleading and could have been better chosen. Philippa Gregory wrote an awesome story, but it was primarily about Margaret Tudor and interactions she had with her sister Mary and sister in law Katherine of Aragon. The title led me to believe that this was more an equal story, maybe alternating, about each of the three queens. There was an equal amount of interaction that she (Margaret) had with her sisters as she did with anyone else in her story, but I do suppose the interactions with the sisters was more pronounced and intimate than as with others. Possibly. Still, it was totally worth the read. Obviously this is historical fiction, but the history part was very accurate. I love being able to put a (fictional) personal image to a historical figure. They compliment each other perfectly! And I mean PERFECTLY! Those two could have collaborated on these two books. This audio book was just as I expected! Three Sisters, Three Queens kept me entertained with all the rich and deceitful people in Tudor times. I love all the twists and unexp ected turns her characters have to endure. Phillipa Gregory's novel was worth the wait! I only hope she's penning another one, now. Her narrator Bianca Amato is one of the best in her field, she's brings life to every character! The problem with this book is that the Scottish Queen was a very strong historical figure and the writer characterizes her as a jealous, whining woman over concerned with her love life. I don't believe that anyone who accomplished what she did during those times could be as petty as she is portrayed and as clueless to the consequences of her choices or her lack of power in a male world. It wasn't believable to me. And the Jealousy card was played over and over and over again. This seemed to be a whole book about Margaret Tudor never really figuring out how to be anything except an envious teenager-like character. Maybe she was like this. I haven't read enough factual accounts of her to say. It became quite tedious to listen to even though the narrator was great. As always another incredible book by Phillipa Gregory! I have read every book she has ever written and this book is as wonderful as the many others. I am always so impressed by the research and dedication she puts into her novels and her striking ability to fill in the gaps of what is known with honest thought and an amazing desire to bring these women into focus in a way that can only be done by taking the facts and carefully building a story around them. In the end I have always felt that she, above all other writers in historical fiction is able to so carefully bring into our imaginations possible and likely personalities to these great women who lived in a time most of us will have a near impossible time relating to. I recommend this book and the incredible narrator to anyone who loves to know more about these historical times. Nobody can transport you through time better than Phillipa Gregory! Also, if you have not read her other books I recommend them all. As my favorite writer she continues to impress me and she writes books that I am so eager to read that I go through them with a swift hunger for more. Her books have taught me so much about history and the various Kings, Queens, and customs of the time that my husband, a historian and archaeologist, concedes that I know more facts about the royal families of England than he does! Enjoy! The writing is fine and the narration is good, but the author makes an insurmountable storytelling mistake in forcing the reader to endure an intolerable main character without any relief. It's unendurable and I could not finish the book. Margaret is an unrelenting idiot, and I just couldn't stand her anymore. I wish the author had allowed us to spend time with someone in the historical narrative that we could admire, relate to, or empathize with. P.G. is usually brain candy, but this was garbage. Magy was written with little depth and generally unlikeable. Sadly this was not a pleasant book to listen too. I want to always remind the so called historical author that you cannot use today's lifestyle to judge the past. The vilification or extraordinary extrapolation on character development in her stories is why I cannot take her serious as a historian. Though her books are amusing. This was not amusing or entertainment. Bianca is an excellent reader! Only good thing about listening to this book. This is the usual Philippa Gregory quality of historical novel. However, with this title I expected more first person narrative on all three women. The novel is written in the first person of Margaret, Queen of Scotland, and older sister to Henry VIII. I was a little disappointed about this. I am not sorry I have purchased this book, just feeling a little misled. The best historical fiction writer of them all has done it again! 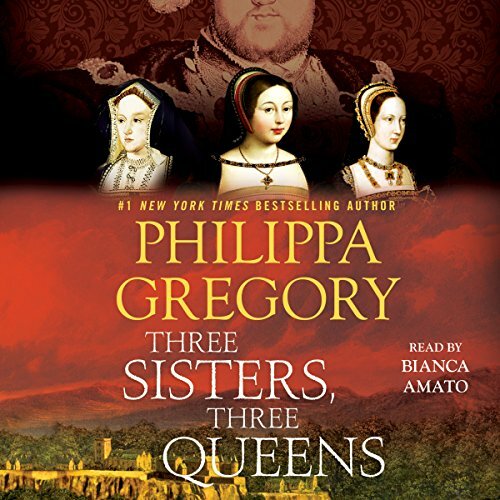 I have been anxiously awaiting the release of Philippa Gregory's latest novel, "Three Sisters, Three Queens," and downloaded it the day it came available. I was not disappointed! As always, Bianca Amato's performance is impeccable! "Three Sisters, Three Queens" explores the lives of three women, perhaps not as familiar to us as the likes of the Boleyns or the Parrs. We have the opportunity to look more closely at Margaret and Mary, sisters of King Henry VIII, and his first wife, Catherine of Aragon. Passions, betrayals, masques, and jousts, Gregory does not disappoint. A Triumph not to be missed! I know that this falls under 'Historical Fiction' however Philippa Gregory is a scholar of history and her knowledge of the Tudor period is impeccable. I'd like to think of this book as a type of historical 'alternative'. From the title it is apparent that this is a story about three Queens however I felt that it was a journey back through time observing three very diverse women and the people around them. Personally however I felt that they were pawns as in a game of chess being manipulated by the men around them. One Queen too busy being a martyr, another too weak and flighty and the last Queen who evolves from a feeble young girl like an acorn into a strong oak tree. She becomes resilient and canny enough to stick to her guns in order to change her situation. This is the first book that I have listened to that I have physically seethed at one of the characters and yelled out loud "Grow a back bone woman"! There is a male character that I got so angry with that I was grinding my teeth every time he came on the scene. I was engrossed from the first sentence. It has a pulse. Bianca Amato, as usual , breaths life into every word which makes it rush by far too fast. So few authors develop the character of Margaret, sister of Henry VIII. I feel that I have traveled back in time. Must admit that I shed a few tears and even shared some pride when I watched through a Mother's eyes a son grew from a babe in arms into a strong King. I loved this book. A thoroughly enjoyable read.